How big of a Deadpool fan are you? Do you know the true roots of Wade Wilson? Before making his triumphant return during the Secret Invasion, you now have the chance to catch yourself up to speed with everyone's favorite "merc with a mouth" - Deadpool. 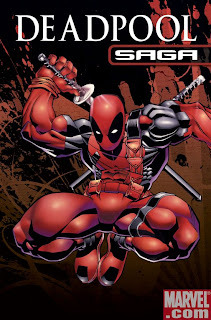 Marvel Digital Comics Unlimited is proud to present the DEADPOOL SAGA free of charge at Marvel.com to Wade Wilson fans everywhere! Marvel Digital Comics Unlimited is your one stop shop for all things Deadpool. Learn how Wade got his healing ability and became the best mercenary in the Marvel U. Did he have any love interests? Of course he did, he's Deadpool for crying out loud! But to find out who, and the answers to many other questions, be sure read DEADPOOL SAGA.